Tomorrow is my birthday. I had dinner and drinks with the girls the other night and we then we will celebrate next weekend as a family - dinner and shopping. Very low key. The way I like it. Ward has been asking me what I want for my birthday. I’ve been thinking long and hard about it. All I could think of was, a shopping spree at Horny Toad, Patagonia, and NorthFace. Then he showed me these babies. They are Barefoot Pace Gloves by Merrell. I am in love. I’ve been wanting a low profile shoe and I’ve really loved the Vibram Five fingers. But I wasn’t sure of the feeling around my toes. 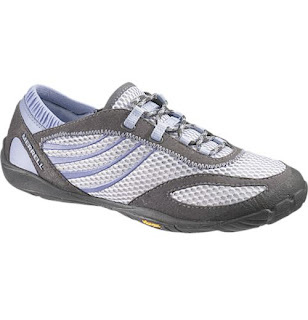 I just wish there was a Merrell shore store closer so I could try them on before I buy them. Should I just go for it? Buy them online and hope they work? Hopefully there is free returns if they don’t work out! Or, should I look for some low profile racers first? Hmmm….decisions.